For other uses, see Floodlight (disambiguation). LED floodlights are bright enough to be used for illumination purposes on large sport fields. The main advantages of LEDs in this application are their lower power consumption, longer life, and instant start-up (the lack of a "warm-up" period reduces game delays after power outages). The first sport to play under floodlights was polo, on 18 July 1878. Ranelagh Club hosted a match in Fulham, London, England against the Hurlingham Club. In August 1879, two matches of Australian rules football were staged at the Melbourne Cricket Ground under electric lights. The first was between two "scratch" teams composed of military personnel. The following week, two of the city's leading football clubs, rivals Carlton and Melbourne, played another night match. On both occasions, the lights failed to illuminate the whole ground, and the spectators struggled to make sense of the action in the murky conditions. Cricket was first played under floodlights on Monday, 11 August 1952, in England. The match was watched by several million people on their television sets. Since then most test playing countries have installed floodlights in some or all of their stadiums. Traditional Cricket floodlights have a long pole on which lights are fixed. This is done because several times, the ball travels too high when a batsman hits it and high lights are needed to keep the ball in sight. However, many cricket stadiums have different types of floodlights like the ANZ Stadium in Australia. The DSC Cricket Stadium in Dubai recently installed Ring of Fire system of floodlights which is latest and smartest system of floodlight in the world. Bramall Lane was reportedly the first stadium to host floodlit association football matches, dating as far back as 1878, when there were experimental matches at the Sheffield stadium during the dark winter afternoons. With no national grid, lights were powered by batteries and dynamoes, and were unreliable. Blackburn and Darwen also hosted floodlit matches in 1878. Thames Ironworks (who would later be re-formed as West Ham United) played a number of friendly matches under artificial light at their Hermit Road ground during their inaugural season of 1895–96. These experiments, which included high-profile fixtures against Arsenal and West Bromwich Albion, were set up using engineers and equipment from the Thames Ironworks and Shipbuilding Company. In 1929 the Providence Clamdiggers football club hosted the Bethlehem Steel "under the rays of powerful flood lights, an innovation in soccer" at their Providence, Rhode Island stadium. On 10 May 1933, Sunderland F.C. played a friendly match in Paris against RC Paris under floodlights. The floodlights were fixed to overhead wires strung above and across the pitch. A fresh white coloured ball was introduced after about every 20 minutes and the goalposts were painted yellow. In the 1930s, Herbert Chapman installed lights into the new West Stand at Highbury but the Football League refused to sanction their use. This situation lasted until the 1950s, when the popularity of floodlit friendlies became such that the League relented. In September 1949, South Liverpool's Holly Park ground hosted the first game in England under "permanent" floodlights: a friendly against a Nigerian XI. In 1950, Southampton's stadium, The Dell, became the first ground in England to have permanent floodlighting installed. The first game played under the lights there was on 31 October 1950, in a friendly against Bournemouth & Boscombe Athletic, followed a year later by the first "official" match under floodlights, a Football Combination (reserve team) match against Tottenham Hotspur on 1 October 1951. The first international game under floodlights of an England game at Wembley was 30 November 1955 against Spain, England winning 4–1. The first floodlit Football League match took place at Fratton Park, Portsmouth on 22 February 1956 between Portsmouth and Newcastle United. 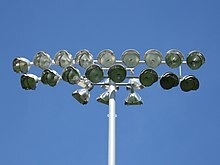 Many clubs have taken their floodlights down and replaced them with new ones along the roof line of the stands. This previously had not been possible as many grounds comprised open terraces and roof lines on covered stands were too low. Elland Road, Old Trafford and Anfield were the first major grounds to do this in the early 1990s. Deepdale, The Galpharm Stadium and the JJB Stadium have since been built with traditional floodlights on pylons. The First Rugby League Match to be played under floodlights was on 14 December 1932 when Wigan met Leeds in an exhibition match played at White City Stadium in London (8pm Kick Off). Leeds won 18–9 in front of a crowd of over 10,000 spectators. The venture was such a success that the owners of the White City Ground took over the "Wigan Highfield" club and moved them to play Rugby League games at the ground under floodlights the following season, with most of their matches kicking off on Wednesday Nights at 8pm. That venture only lasted one season before the club moved back up north. The first floodlit match for rugby league played in the heartlands was on 31 October 1951 at Odsal Stadium, Bradford when Bradford Northern played New Zealand in front of 29,072. For a club to play in the Super League they must have a ground with floodlights adequate for playing a professional game. ^ "edisontechcenter.org/SodiumLamps". edisontechcenter.org. Archived from the original on 18 September 2014. ^ Inglis, Simon (2014). Played in London. Swindon: English Heritage. p. 22. ISBN 978-1-84802-057-3. ^ "Let there be light". cricinfo.com. Retrieved 5 May 2018. ^ "Dubai Sports City". Dubaisportscity.ae. 19 August 2008. Archived from the original on 31 May 2011. Retrieved 22 October 2009. ^ Powles, John (29 June 2017). "The amazing story of West Ham United's first home ground". West Ham United F.C. Retrieved 12 January 2018. ^ Tongue, Steve (2016). Turf Wars: A History of London Football. Pitch Publishing. p. 23. ISBN 978-1-78531-248-9. ^ "Draw with Providence in Night Soccer game". Bethlehem Steel Soccer. Archived from the original on 11 August 2016. Retrieved 23 September 2016. ^ Lanchberry, Edward (1950). Footballer’s Progress: Raich Carter. Sporting Handbooks Ltd. p. 183. ^ Garrick, Frank (2003). Raich Carter The Biography. SportsBooks Limited. p. 34. ISBN 1 899807 18 7. ^ "The History Of The Football League". The Football League. Archived from the original on 11 February 2007. Retrieved 22 February 2007. ^ "The History Of Rugby League". Rugby League Information. napit.co.uk. Archived from the original on 8 December 2013. Retrieved 2 January 2014. ^ "Timeline of events at Odsal stadium" (PDF). Past Times the social history of Odsal stadium project. Bradford Bulls Foundation. Archived from the original (PDF) on 2 April 2012. Retrieved 6 September 2011.